Researchers at the Children’s Hospital of Philadelphia analyzed the DNA of thousands of children to isolate the gene, called DENND1B, according to the study in today’s New England Journal of Medicine. The gene influences action on immune system cells involved in the body’s response to foreign material such as viruses, bacteria and allergens. This is the second gene found linked to asthma, a condition thought to be triggered by a combination of genetic and environmental causes, according to the study. Although the illness can be controlled by drugs, less than half of the 22 million asthmatics in the U.S. are properly managed, according to surveys from the American Lung Association. The rate of asthma in the U.S. more than doubled to 7.1 percent of the population in 2004 from 3.1 percent in 1980, according to the U.S. Centers for Disease Control and Prevention, an Atlanta-based agency. Asthma occurs when narrow or inflamed airways cause wheezing, coughing, chest tightness, and shortness of breath, according to the Mayo Clinic’s Web site. No cure exists for asthma, according to the National Institutes of Health, an agency in Bethesda, Maryland. It can be treated by inhaled steroids such as Symbicort, sold by London- based AstraZeneca Plc, and by Flonase from London-based GlaxoSmithKline Plc. Other researchers had found an asthma-susceptibility gene on chromosome 17 in 2007. In today’s study, researchers led by Hakon Hakonarson, the director of the Center for Applied Genomics at the Children’s Hospital of Philadelphia, isolated the DENND1B gene on chromosome 1. The gene may prove to be “an extremely strong drug target for asthma,” Hakonarson said yesterday in a telephone interview. The researchers initially analyzed the genomes, or complete gene sets, of 793 white North American children with asthma, compared with a control group of 1,988 healthy children. They confirmed the results in a separate group of about 2,400 Europeans and controls, then did further analyses on about 3,700 black children. The scientists were able to duplicate earlier findings of the chromosome-17 gene, and they discovered the new DENND1B location on chromosome 1 that was strongly associated with the disease in the white and black children. Several genes are most likely involved in predisposing people to asthma, according to the report. The DENND1B gene the researchers pinpointed acts on dendritic cells that regulate the body’s immune response to trigger inflammation. After a foreign particle enters 22the airways, the dendritic cells pick it up, process it, and present it to an immune cell that may attack it in an allergic reaction. About 70 percent of people with asthma also have allergies, according to the World Health Organization in Geneva, Switzerland. Because this gene seems to play “a critical role” in how sensitized the body is to allergens, Hakonarson said, it could advance research into that area as well. In follow-up studies, the researchers have found that DENND1B is also implicated in other immune and inflammatory diseases, although they haven’t yet reported that data. “It’s showing up as a very powerful gene,” Hakonarson said in a Dec. 22 phone interview. Genes and environment contribute to asthma, according to the Washington-based American Lung Association. 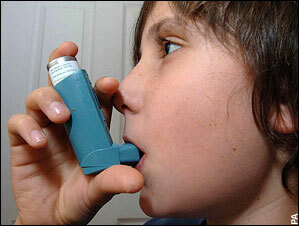 If one parent has asthma, a child is three times more likely to get the disease, according to the lung association. Common environmental triggers of asthma include air pollution, mold, cockroach dust, and cigarette smoke, according to the CDC. Jobs that involve inhaling harmful substances, such as wood dust or smelting fumes, cause 11 percent of asthma cases, according to the World Health Organization, a United Nations agency. Drug treatments for asthma include bronchodilators, which relax the muscles around the airway, providing quick relief during an asthma attack, and inhaled steroids, which are used over time to prevent swelling. While steroids are effective at managing the disease long- term, many people don’t use them, according to Edelman. Surveys by the lung association have found that the disease is properly controlled in less than 40 percent of asthmatics. He attributes this to the high cost of the drugs, coupled with the fact that inhaled therapies are cumbersome to use.